198 pages | 4 B/W Illus. Multinational federations rest on the coexistence of two or more nations within a single polity. Within these federations, minority nations play a significant role as their character differs from the other building blocks of the federation. 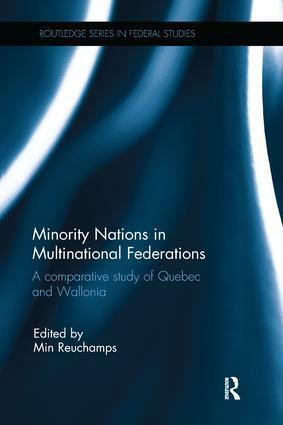 This edited volume offers a comprehensive comparison of two such minority nations - Quebec in Canada and Wallonia in Belgium - which exemplifies many dimensions, themes and issues highly resonant to the study of federalism and regionalism across the globe. Quebec and Wallonia have experienced several decades of federal dynamics where both regions have had to find their way as a minority nation in a multinational federation. For those studying federalism and regionalism their importance lies in a number of characteristics, but principally in the fact of these minority nations have transformed into mini-states with fully fledged legislative powers within their federation. This book seeks to study the specific dynamics within these small worlds and between them and the rest of the federation. This text will be of key interest to students and scholars of federalism, nationalism and regionalism, comparative politics and policies, political ideas and social movements. Min Reuchamps is Professor of Political Science at the Université catholique de Louvain, Belgium. The series publishes outstanding scholarship on federalism and decentralization, defined broadly, and is open to theoretical, empirical, philosophical, and historical works. The series includes two types of work: firstly, it features research monographs that are substantially based on primary research and make a significant original contribution to their field. Secondly, it contains works that address key issues of policy-relevant interest or summarise the research literature and provide a broad comparative coverage.